This soft woven 100 percent cotton robe for women from Alexander Del Rossa is comfortable, durable, and classy. Rich in features, we trust that this cotton lounge robe for women will not disappoint. Machine Wash and Dry - so that you do not have to interrupt your normal washing routines. FOR YOUR MORNING ROUTINE - Imagine this: It's morning and you can't bring yourself to leave the warmth of your bed. But then you remember that your cotton robe is right next to your bedside and you can slip it on as your feet hit the floor. You'll feel like you never left your sheets. FOR LOUNGING - Whether it is saturay morning, movie night, or spring cleaning day - you can float around your house in this comfortable cotton robe and feel relaxed no matter what you are doing. FOR NEW MOMS - this beautiful woven robe is a perfect gift for new mothers. When you have a newborn baby you tend to get a lot of visitors - and the last thing you want to do is get out of your pajamas. Take the hassle out of guests and throw on your robe the moment the doorbell rings. FOR NURSING - There is nothing worse than waking up in the middle of the night to breastfeed your young child only to be met with a cool draft as you leave your bed. Slip on your robe and have easy access to nurse while staying warm. PRE-SHRUNK 100% COTTON FABRIC - Enjoy the comfort of this lightweight robe made from our premium 100% cotton fabric. All of our cotton is pre-shrunk so that you never have to worry about your garment shrinking in the wash. Cotton is a highly sustainable and re-newable resource, meaning you can enjoy peace of mind while you lounge in this soft robe for women. INSIDE TIE CLOSURE - There is nothing worse than sitting down only to have your lounge robe open up unexpectedly. That is why we have included an inside tie in the design of this robe to keep your robe closed at all times. Simply tie the inside closure as tight as you'd like for an added sense of security while guests are present. Hosting guests or going on vacation with relatives? Now you can stay comfortable and covered no matter who is around. TWO FRONT POCKETS - Each one of our classic lightweight cotton robes for women feature two patch pockets in the front of the garment that are perfect for holding your phone, snacks, remote, or other necessities. Use these handy pockets to keep your hands warm or to keep things close by your side while you are lounging or nursing your baby. 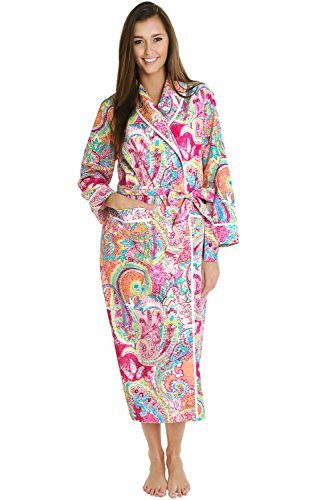 GREAT AS A GIFT - A robe is one of those warm familiar products that you didn't know you needed until you finally got one - which is why it makes the perfect birthday or Christmas gift for your mom, wife, daughter, or friend. We also have a lot of customers purchasing this robe for expectant mothes because this robe can stay with them through each stage: pregnancy, labor and deliveryy, and even nursing their new baby.